Starting today, you're the bus driver! Due to the nature of this game, a walkthrough isn't necessary or even useful for the standard stages, so this guide won't go into those much. The tutorial stages are the important part. Read these as you play each stage, and you'll be a bus driving pro by the end. Or at least, you'll vaguely understand how to drive a bus. 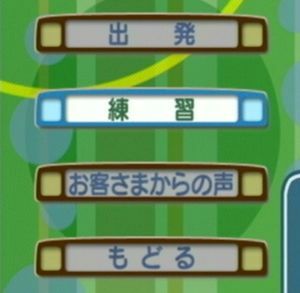 The following sections are for 練習 / Practice (Tutorial) Mode stages. This tutorial starts out showing you the Speedometer and the Speed Limit indicator. If you go 6km/h over the speed limit, you'll be penalized (-10 points). The gauge on the left shows how you're doing, and it goes down each time you're penalized. The gauge has a total of 100 points. An empty gauge means Game Over. The next thing you'll learn is to use the accelerator. Press the gas pedal to drive forward. Then, after the next dialogue, press the brake pedal to use the brakes and stop. You'll be penalized for slamming too hard on the accelerator or the brakes (-5 points). Next is turning. Use Turn the steering wheel left to go around the turn. You'll be penalized for bumping into the walls, for an instant Game Over. Keep driving after the turn, and the tutorial will end once you pass the green line. You can use side-view mirrors to see what's beside your bus. You should always use the side-view mirrors when you're changing lanes. Also available are top-view modes that show the front and back bumpers of the bus. Press and hold the left paddle to show the left side-view mirror. The tutorial requires that you hold it until the next message appears. Press the right paddle to show the right side-view mirror. Press to show the front bumper view, and to show the back bumper view. Once you've done these to the game's satisfaction, this tutorial is over. In this game, you must follow the rules of the road. The top of the screen shows what the next stop light looks like. In case you need a refresher, Green means you can go, Yellow means the light is about to turn Red, and Red means you have to stop. Running a red light will get you penalized. There are also direction-specific green lights that tell you when it's legal to turn or go forward, independently of the main lights. If the light is red, but there's a green arrow pointing forward, then you only need to stop if you're planning to make a turn. All you have to do here after the dialogues is drive through the green light and keep going. Check out the arrow indicator in the top left of the screen. This shows the direction you're supposed to travel at the next intersection. When it changes to a multiple lane display, it tells you which lanes you can be in to legally cross the next intersection or make the next turn. To clear this tutorial, just get in the left lane and drive to the end. Always use your turn signal! Not just when making turns, but also when changing lanes. After the dialogues, press to activate the left turn signal. Then after the next dialogue, press again to deactivate it. Your task here is to make the left turn up ahead. Make sure the light is green, activate the turn signal, and turn left. Be careful not to go off course. Inside turns in a bus are pretty tough. If you're in the driver view, you can use to pan the camera to the left a bit. This tutorial is exactly the same as the last one, except you use to activate the right turn signal, and turn right. The turn on this one is much easier, because it's on the outside. If you're in the driver view, you can use to pan the camera right. You must use the turn signal when changing lanes. In this tutorial, all you have to do is activate your right turn signal, change lanes, and drive to the end. Here you learn that you must always stop at a railroad crossing, even if there's no train coming. The indicator in the top left corner will tell you when there's a railroad crossing ahead. Just drive up to the line, brake to a full stop, and then continue on. Now to the bus-specific rules. The text above the driving gauge tells you the distance to the next bus stop in meters. The icon to the left shows if you have a passenger on board who wants to get off at the next stop. The blue person icon means there are people waiting at the bus stop to get on. The glowing yellow area on the road indicates a bus stop. Drive forward and stop within the yellow area, then activate your left turn signal. Next you need to open the bus door with . That'll end the tutorial. When departing from the bus stop, the first thing you must do is close the bus door with . Then, activate your right turn signal. Then you press again to make an announcement to your passengers. The announcement in the tutorial is just a short tone, but in the main game it's a description of the bus route. You'll get a penalty if you fail to play the announcement after new passengers get on the bus, or if you start driving before the announcement is done. The TIME indicator on the right side of the screen shows what time you need to be at the bus stop. NOW shows the current time. Use what you learned in the last two tutorials to depart from the first bus stop, and park at the second. Start by closing the door, setting the right blinker on, and then making the announcement. Note that all bus stops are on the left side of the road relative to the bus, so this sequence will never change based on which direction you're going. This page was last edited on 25 February 2010, at 04:10.